A few weeks ago I went on a hunt around the neighbourhood for banana leaves to create some comfort food from my motherland, Malaysia. Who would've thought that banana leaves cost $7 in this island country??! After creating an epic grilled salmon with the banana leaves, there was still a whole lot of leftover. Back to the banana leaves... For one whole week, I could not get over how expensive these leaves are. C'mon, they're just the byproduct of banana...surely they cannot cost that much! However, the aromatic leaves brought to mind a street food that is my childhood favourite: otak-otak, which literally translates to brain. It's not another one of those funky Asian food - No actual brains are being harvested for this dish :) Instead, it is a spicy fish paste wrapped in banana leaf or coconut leaf, in long slices or in a parcel. These little goodies are then steamed or grilled. Despite the unfortunate name, it is absolutely delicious: Filled with spices such as turmeric and curry powder, it is at once aromatic with a hint of spice and heat that will surely warm you up on a winter night. Since I've moved to Melbourne, otak-otak is the singular dish that I miss the most about home. For years I have searched for a replacement in vain - none of the restaurant version could compare to the one I had when I was growing up. Hence, I took it upon myself to search for a home-made version that could perhaps match up to what my tastebuds have missed... and I am proud to say, if you are after an authentic Muar otak-otak, this is a 90% match. Most ingredients in this recipe can be easily found in your local Asian grocer, and mackerel is not too exotic in Australia. I do recommend that you get your fishmonger to de-scale and de-bone the fillets though, as you will be blending the fish in a food blender. I spent way too long de-boning my mackerel fillets, which gave me sore fingertips for days! It may look easy on Masterchef, but certainly not in real life. I would also recommend to steam the parcel before grilling it so the parcel may hold the shape, and you can choose to freeze some of the fish cake parcels. They can keep up to 3 months if stored in the freezer. While in Malaysia otak-otak is grilled over open fire, but this is Melbourne, it's not barbecue season yet and... well, we don't have a grill. Luckily, grilling it in the oven at 250C for 10 minutes work fine too. When the parcels came out of the oven, banana leaves all wilted and dried out, I was transported back to Muar: I am sitting around the dinner table with my mum, dad, surrounded by my aunts, my grandma sitting around with a big smile on her face. A bite on the fish cake warmed me up instantly, though the sudden heat did surprise me. It was the familiar taste of coconut milk and turmeric. I could almost hear the sing-song teochew again, the dialect that reminds me that I am still that clueless girl from all those years ago, and it is extremely humbling. If you've had enough me going on about my childhood, here is the recipe. Do try it and let me know how you like it! 100ml Water (or more)... However, this is optional. If you are using banana leaves : Grab a bunch of banana leaves from the Asian grocer. 1. Prepare your banana leaves - Wilt the banana leaves by steaming them. Then, trim it into your preferred size. Mine was about 6" x 10" big. 2. Debone fish. Use a spoon, scrape the fish meat out. 3. Set aside 150g of fish meat. Place the remaining 300g fish meat into a food processor. Add in coconut milk. Blend it into a smooth paste. 4. Scrape the fish paste mixture into a big bowl, add in all the seasoning. Mix until everything is incorporated. Then, add in the 150g fish meat chunk. 5. If you find the fish paste too dry (which I think you will), this is the time you add 100g water. Mix again. If you are not confident about the texture, put a dollop of fish paste on a frying pan, pan-fry it. Give the texture a try. 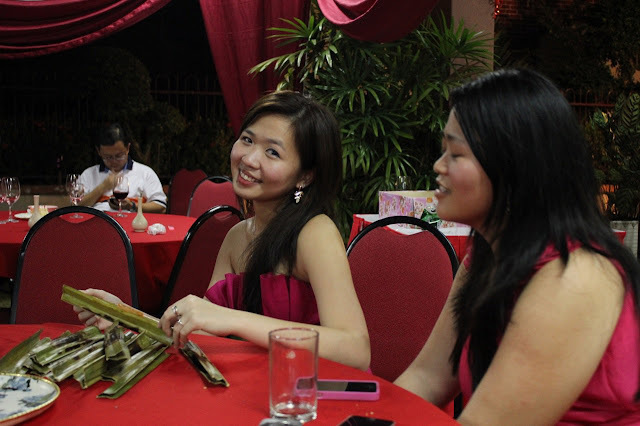 If the otak is soft enough to your liking when it is cooked, then, proceed to wrap your otak paste with banana leaves. If you want your otak to have a softer texture, add more water, mix, pan-fry it, try again. Rinse and repeat until you achieve your preferred texture. 6. Wrap otak paste using prepared banana leaves. I wrap mine at about 100g otak paste each. 7. Steam the wrapped otak under high flame. I steamed it for 5 mins, and then grill it to perfection. 8. Grill the otak over charcoal fire or in 250C oven (on Grill setting) until slightly charred. Serve hot. 9. If you are not able to finish all the grilled otak, wrap them well and keep it in the freezer. Just repeat step 7 and 8 when you want to eat them. Just found this recipe. As a Muar hometown girl now residing in Melbourne, you have no idea how excited I am! I am looking forward to trying this. Hi Hui, thanks for reaching out! Good to see a fellow Muarian. Just attempted kuey chap and pig offal soup from Hua Nam Kopitiam last week but no success. Hi Sammy, I haven't got Instragram, I'm not too social media savvy unfortunately! I love kuey chap. Where do you source the ingredients?